What's a favorite activity for Hamlin Lake area residents and visitors? With so many things to do, it's nearly impossible to list them all--but one of the favorite pastimes has to be canoeing along the beautiful shoreline of Hamlin Lake. 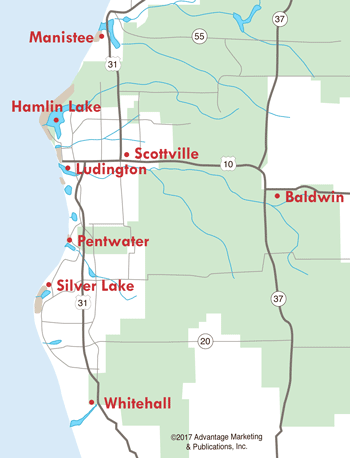 Within the Ludington State Park, canoeing and kayaking enthusiasts love the Hamlin Lake Canoe Trail--a marked waterway which makes for a wonderful 2-4 hour diversion. The time needed to traverse the trail depends upon skill level and weather conditions, but the 2-4 hour estimate is typical under most circumstances. You can travel the waters by yourself, or take advantage of the guided canoe trips offered through Dune Grass Concessions. A Michigan DNR interpretive specialist will explain the flora, fauna, and history of the area. For more information, call (231) 843-1888. The Hamlin Lake Canoe Pathway begins and ends at the Hamlin Lake Watercraft Rental/Dune Grass Concessions area near the swimming beach. 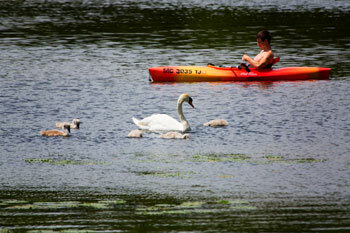 At the concession you can rent paddle boats, canoes, kayaks, tandem kayaks, stand up paddle boards and rowboats. Once you have your watercraft, you can cross the river and head into Hamlin Lake. As you travel close to the south shore, you'll enjoy a variety of landscapes, from swampy area filled with reeds and cattails, to the "Carp Ponds," named for the many carp that spawn there in the spring. Within the marshlands along the trail is an excellent habitat for duck, geese, herons and others. Near the beginning of the Hamlin Lake Canoe Trail you'll encounter two large, sandy hills, known as Desperation Point. Local sailors gave it this name because of the unpredictable shifting winds found there. The trail is not demanding for a canoeist with minimal experience, but care should be taken to avoid various submerged tree stumps. Ask about guided canoe trips, where a Michigan DNR interpretive specialist explains the flora, fauna, and history of the area. 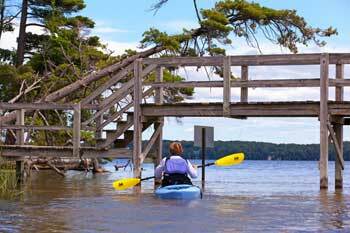 Ludington State Park on Hamlin Lake -- Explore Hamlin Lake and surrounding waterways, starting from the State Park canoe and kayak trails.